Brandon Stokley (born June 23, 1976) is a retired American football wide receiver. He was drafted by the Baltimore Ravens in the fourth round of the 1999 NFL Draft. He played college football at Louisiana-Lafayette. Stokley also played for the Indianapolis Colts, Denver Broncos, Seattle Seahawks, and New York Giants. His father, Nelson Stokley, played college football at LSU and was the head coach of the Louisiana–Lafayette Ragin' Cajuns from 1986 to 1998. Brandon played wide receiver under his father from 1994 to 1997, with Jake Delhomme as quarterback through the 1996 season. While in college, Brandon met his future wife, Lana, a two-time All-America left fielder in softball who led Southwestern Louisiana to two College World Series. They have two sons, Cameron and Carson. Stokley signed with the Denver Broncos on March 14, 2007. On December 7, 2007, he signed a 3-year extension with the team. In a memorable play from the Broncos' 2009 season opener, Stokley caught a pass intended for teammate Brandon Marshall that was tipped by Cincinnati Bengal Leon Hall, and took it 87 yards into the end zone for the winning score. As he reached the 5-yard line he abruptly changed direction and ran parallel to the goal line, running an additional six seconds off the clock, only crossing into the end zone once he reached the opposite side of the field. This ensured a win for the Broncos, who were trailing the Cincinnati Bengals 7–6 with 28 seconds left before Stokley's touchdown reception. The back-end of this play can be seen in the introduction of Madden NFL 11. With Stokley's touchdown, the final score was 12–7 and the Broncos got their first 2009 regular season win. The play was also memorable for play-by-play commentator Gus Johnson's call. During a December 27 game at Philadelphia, Stokley was ejected for slapping a referee on the hand while expressing his anger that a pass interference penalty was not called. 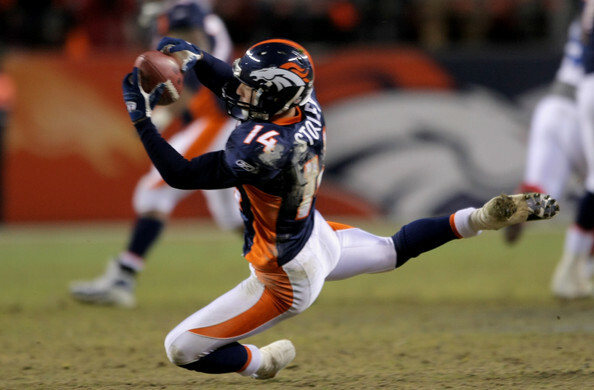 On September 4, 2010, Stokley was released by the Broncos. Stokley signed with the Seattle Seahawks on September 28, 2010. His most notable contribution in Seattle came in the 2010 NFL Playoffs against the New Orleans Saints and the Chicago Bears. In those games, Stokley was the leading receiver for Seattle, catching four passes for 73 yards and a touchdown against New Orleans and 8 catches for 86 yards and a touchdown against Chicago. His clutch performance was key to the 7-9 Seahawks' surprise upset of the defending Super Bowl champion New Orleans Saints. He was later cut by the Seahawks after the 2011 lockout ended. During free agency he expressed interest in the Washington Redskins but never signed with Washington. On August 10, 2013, Stokley agreed to terms with the Baltimore Ravens, reuniting him with the team that drafted him in 1999. On August 11, 2013, Stokley officially signed a one-year deal with the Ravens. On October 5, 2013, the Ravens cut Stokley. On October 8, 2013, the Ravens re-signed Stokley. Stokley suffered a concussion in a Week 14 victory over the Minnesota Vikings and was subsequently placed on injured reserve, ending his season. On December 26, Stokley announced his decision to retire after the season.